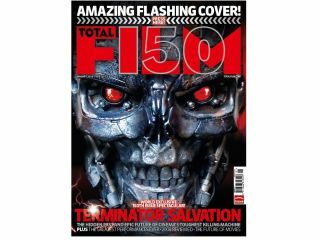 It's Judgement Day for our friends at Total Film this month, with the release of the magazine's 150th issue – which comes complete with an iconic Terminator cover. It's not just any old cover, either; flashing LEDs have been installed into the Terminator's face to give the robot its familiar red-eyed stare. The robotic cover star has been especially chosen, as the issue comes packed with news about the upcoming Terminator Salvation – the fourth instalment in the Terminator franchise. Speaking about the landmark issue, Aubrey Day, Group Senior Editor of Total Film, said: "Total Film always likes to do something extra special for its 'anniversary' issues (We did a Star Wars lenticular cover for our 100th and a Pirates gatefold for our 10th Birthday). And Terminator Salvation is one of the most anticipated, and talked about releases of 2009. So it seemed the perfect fit for our 150th issue. Fortunately, Sony Pictures agreed! "Months of negotiation and collaboration resulted in a feature we're really proud of – the first look and real insight into the new film as well as a no-holds-barred retrospective of the previous Terminator movies. He continued: "The cover utilises two push-button LED lights (a magazine first, I think) for that iconic 'blinking red eye' look. Every time you push the button, the cover flashes 15 times and it should be good for 800 to 1,000 pushes! "In planning the cover, it was important to us not to use technology for technology's sake but apply a treatment that supported the editorial content. We think we've managed it." Total Film, issue 150, is out 11 December. Point your browser to www.totalfilm.com, where they have more about the commemorative issue and a little video surprise.